Inspiration- I have an hour and twenty minute commute to work each way. If I didn’t have podcasts to listen to I would go insane. Lately, most of my favorites are food related. Often when I hear someone describing a recipe or dish that sounds delicious I jot it down to try later. Planning– First, l go to the site where the recipe is and print it out. I usually scan it for ingredients and technique. Next, I’ll usually look up a number of similar recipes to see what variations on the theme are out there and think about substitutions if I don’t have/want to get particular ingredients. Gathering supplies- I like to go out and get supplies for projects. There is something satisfying about getting all the stuff you need together. It starts the transition from visualizing to actually making something. Implementation- I like being in the kitchen. I only recently made the connection of how similar working in a kitchen is to working in a shop/lab. The time frame is usually short enough to get something made in a day or less which means I’m more likely to want to take it on. Results- There is always a finished product when you are making food. I love to eat delicious things and think about what makes it taste good to me. Trying new stuff expands my palate and is generally interesting. It is always nice to share food with others too. David Liebowitz is a food blogger I have been following for the past few weeks. He was a pastry chef at Chez Panise and has written several books on making deserts. I bought The Perfect Scoop, it’s all about making ice cream and other frozen confections, on the suggestion of my sister-in-law. (thanks Yun Joo!) He lives in Paris now, seems to travel quite a bit and takes very appetizing pictures of the food he is eating and preparing at the moment. He recently went to NYC and visited a bakery in Red Hook, Brooklyn called Baked. Their products sound fantastic and I like the clean, modern (as in updated mid-century) style of their presentation. 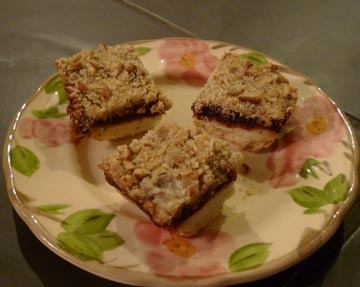 David posted an apricot bar recipe from Baked that he modified somewhat. Although I don’t go out of my way for apricot bars they looked and sounded really appealing to me. I went out after dinner on a Friday night to get ingredients to make them and abandoned my cart after picking up some fresh rosemary for $3.50 and 3 bags of dried apricots at $4 each. I really wanted to make these bars but I wasn’t about to spend $16+ just to try them. I was pacing around the house after I got back home trying to resolve my frugality/spontaneous desire issues. I didn’t come to any real solution and ended up eating several handfuls of chocolate chips. Two days later we were at Molly’s parents’ house and literally as we were walking out the door I remembered that rosemary is a perennial in Albuquerque. I scored a couple of sprigs from my mother-in law (a master gardener) and mulled over how to get around the apricot cost issue during the hour drive back from Abq. By the time we got home I had a solution. Crasins! Maybe a little more pedestrian than apricots but they are a tangy dried fruit and more importantly we had them at the house already. Sort of. I needed two cups but we only had one. So really I should be calling them Crasin/rasinLove bars. I also made one other substitution. David made the addition of lemon zest to the shortbread. We didn’t have any at home so I used key lime zest. I actually like it better. The rosemary & lime in the shortbread really compliment each other without overpowering the other flavors. The Crasin/rasin filling was tasty and everyone played well together for a very satisfying result. 2. Make the rosemary dough by creaming the butter with the powdered sugar and salt in the bowl of a stand mixer, or by hand, until it’s light and fluffy. (3 mins) Add the vanilla, zest, and rosemary, then gradually add in the 1 3/4 cup (250g) flour, mixing until the dough is smooth. 4. Make the apricot filling by combining the apricots, water (or wine), granulated sugar, honey, brandy, and a pinch of salt in a medium saucepan. Simmer over low heat for about (30-) 45 minutes, or until all the liquid has just about been absorbed. Let cool for a few minutes, stirring, then puree in a food processor (blender) until smooth. 8. Spread the filling over the shortbread in the pan evenly, then top with the crumb topping and bake for 20 to 25 minutes, until the topping is browned. Variation: For those of you wishing to use a different dried fruit (Crasins?? ), the yield on the apricot paste was 2 cups (about 500g), in case you wish to make a substitution. They were delicious! I’m picky (and don’t like to try new things). I stared at these for a day sitting under the cake stand and finally grabbed a bit of one. I couldn’t stop eating them and my tummy got a little sore! I learned my lesson- again, very yummy!